Euro Weekly News and The Children for Peace Gala Event held at the Hotel Villa Padierna | Marbella Marbella – Adelante! 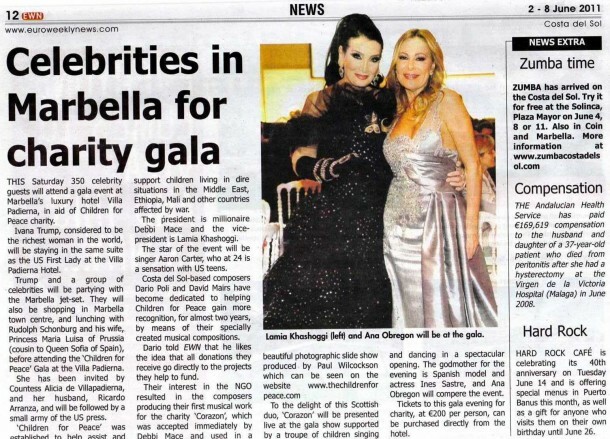 The Marbella Marbella website is proud to be one of the contributors to this glamorous Gala Event for The Children for Peace which has a serious purpose behind the fabulous entertainment that is being provided which is to raise much needed funds for children in dire need. In the beautiful Roman amphitheatre of the hotel Villa Padierna about 70 singing and dancing children will be performing their exciting set choreographed by Manuela Veronese and on a stage, the talents of International stars will perform to the many guests as mentioned in the article and on this website.